My husband Bill’s sweet tooth is usually cookies, but sometimes he gets a taste for the classic banana pudding with vanilla wafers. I thought I would save him a few calories by using reduced fat milk, reduced fat vanilla wafers, lite whipped topping, and to make it just a little different, a sprinkle of toasted coconut for an extra touch. 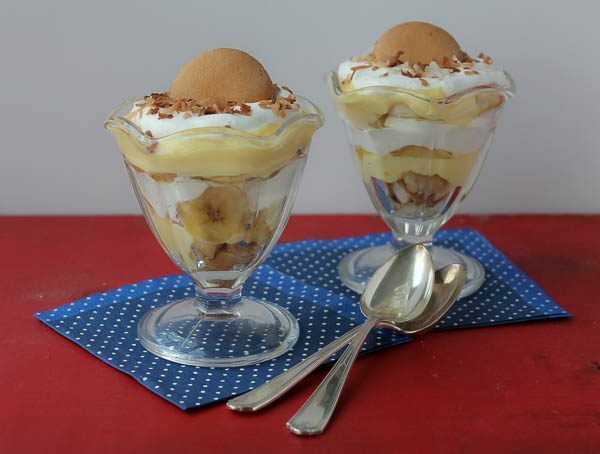 I also used small dessert parfait cups. Looks cute, tastes good, and Bill is happy. He prefers vanilla pudding, but if you like banana/chocolate combo, use chocolate pudding, chocolate wafers, and chocolate sprinkles on top instead of coconut. Place 1 Tablespoon of broken cookies into the bottom of 6-ounce tall parfait glass. 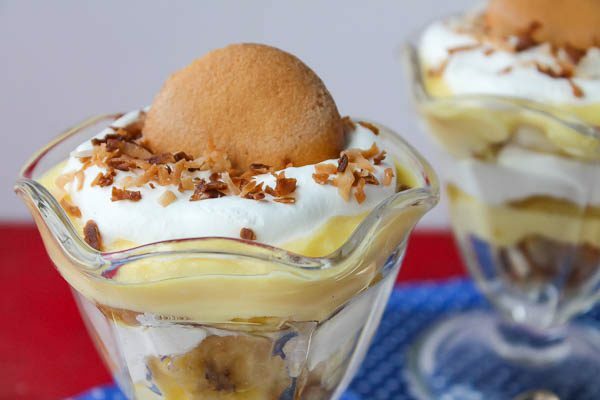 Top with 2 Tablespoons of pudding, 4 banana slices, and 1 Tablespoon of whipped topping. Repeat to form identical layers; set aside and repeat with remaining glasses. Top each with a sprinkling of toasted coconut, if desired. Chill for 30 minutes and serve. Serves 6.